In a prequel , we have shown that the two Boses had a meeting of minds before ever sharing the same physical space. 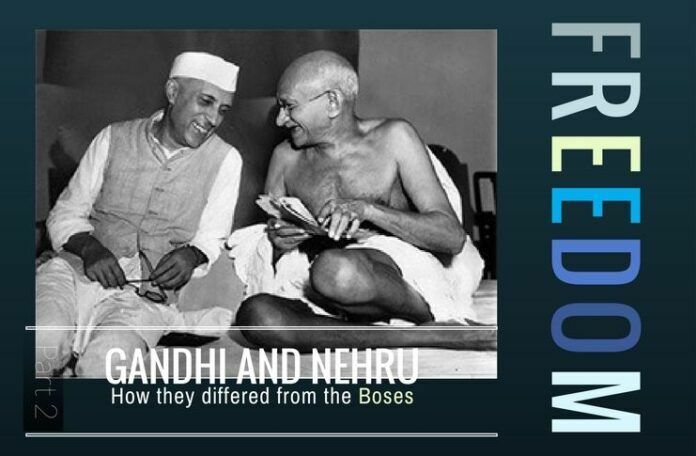 Between themselves, they were ideological kindred souls, but harbored grave ideological differences with the contemporary mainstream political leaders like Gandhi. They differed with him not only on the path to freedom, but surprisingly enough, on what the concept represented. But it is of course possible to admire an individual while disagreeing with his views, we therefore seek to find out how the duo rated other mainstream leaders. Delving into little known correspondences between the duo, their letters to close family, and reminiscences of their comrades, we show that they diverged somewhat on their tactics on the contemporary mainstream political leaders like Gandhi and Nehru. Having never met them in person, due to his long exile, Rashbehari may have nursed rosy illusions about them, while close contact of about two decades enabled Subhas to see through their compromises. The former would be amenable to accepting Gandhi as at least a figurehead of the freedom movement he was presiding on, but the latter would resolutely oppose the same. Rashbehari seemed to have disliked Nehru, and had mildly criticized him, but would not hesitate to quote him as needed, Subhas was in contrast more forthcoming in opposition. We get to the specifics now. Nehru is fanatically anti-Axis and he is much worse than Gandhi. Azad is a blind follower of Gandhi now. In his public discourses, Rashbehari was nothing but laudatory on Gandhi  and Jawaharlal Nehru. For example, in his Presidential address at the Bangkok Conference in June, 1942, he deferred to the duo as: “Let us rise and act so that the great preparations that Mahatma Gandhi has made during the last more than two decades, may bear fruit and our children in future may think of us with pride and respect as the members of a free nation…..Let us not forget the words of Pandit Jawaharlal Nehru when he said :- Success often comes to those who dare and act, it seldom goes to cowards.” pp. 138-139,  . At the time, though, the Japanese still hoped to be able to use Gandhi or Nehru for their politics, as ambassador Oshima explained a few months later pp. 134-135, . So, the accolades Rashbehari showered were possibly part of the war strategy of Japan. We will shortly see that Rashbehari was a master of guile, so was his posture intended to win over the men who placed the Congress and its leaders above the Indian independence movement in East Asia? Incidentally, the CSDIC (I) report on the interrogation of Anand Mohan Sahay says that Rash Behari and his associates “were not very friendly to H/1459 [Sahay] because he was the official representative of Congress which, because of the well-known leanings of its leader Nehru, they suspected of socialism”. p. 393,  Under the given circumstances the CSDIC (I) report provided by British intelligence agency will be more reliable than stated positions. And, we have already seen that Sahay has reported that in late 1920s Rashbehari had no illusions on the prospects of Gandhi’s non-violent non-cooperation and was opposed to forming Congress branches in Japan. [dropcap color=”#008040″ boxed=”yes” boxed_radius=”8px” class=”” id=””]W[/dropcap]here Rashbehari and Subhas certainly differed was on their tactics on Gandhi and Congress. The former would be amenable to accepting Gandhi as at least a figurehead of the freedom movement he was presiding on, but the latter would put his foot down. Rashbehari had suggested to Subhas, in a conversation over telephone on 3rd July, from Bangkok to Berlin, to acknowledge Gandhi as supreme leader in India’s freedom struggle in the East. That was likely a part of Japanese war strategy, as mentioned before. Next day, the Bangkok papers reported in bold letters that the two Boses had agreed to acknowledge the Mahatma as the spiritual head. Subhas, however, was alarmed that his namesake believed and claimed a complete agreement with him on incorporating Gandhi. He therefore wanted to send a telegram to Bangkok, suggesting combining all Indian nationalists of the world in one organisation. Ribbentrop, however, forbade him to do so as it would have contradicted Japanese opinions too much pp. 134-135 . Therefore, on 11 July, 1942, Subhas wrote from Germany to RashBehari as follows pp. 284-286, : “Regarding Mahatma Gandhi, I am sorry to say I cannot agree with you. Gandhi’s epoch in India’s history came to an end in 1939. He has imparted political consciousness to the Indian masses and he built up an All-India political organization. But he stands pledged to non-violence and passive resistance. With such methods you can never expel the British from India and can never win independence. Therefore, Gandhi, while talking of independence, always keeps the door open for a compromise with the British. Since Gandhi wants a compromise with England, he will never become pro-Axis. Only those who are prepared for a complete break with England, can adopt a pro-Axis policy. I have worked under Mahatma Gandhi for 20 years and I know him thoroughly. I do not underestimate his strength and influence, nor do I overestimate it. During these 20 years, I have sometimes fought Gandhi successfully and defeated him. In September, 1939, he declared for cooperation with England and it was our propaganda that forced him to change his attitude. In April, 1940, the Forward Bloc first started passive resistance to cooperation with Britain’s war and Gandhi was thereafter compelled to do so in November, 1940. Gandhi today is no longer a dynamic and revolutionary figure. Only pressure of public opinion can now make him act and we have to influence public opinion through our own propaganda. The recent demand of Gandhi that the Anglo-Americans should leave India, was only the result of our propaganda. But we must always remember that there is a limit to the extent to which Gandhi could be forced to change – for instance: (1) Gandhi will never advocate the use of arms (2) Gandhi will never become pro-Axis in his policy. Nobody has done more harm to me personally and to our cause in this crisis (politicking against him at Tripuri) than Pandit Nehru… he was with the Old Guard at Tripuri. His open propaganda against me has done me more harm than the activities of the 12 stalwarts. What a pity! [dropcap color=”#008040″ boxed=”yes” boxed_radius=”8px” class=”” id=””]C[/dropcap]onsequently, there is no room for cooperation with Gandhi. Every show of strength and defiance that Gandhi puts up, is always followed by an attempt at a compromise. Hence we now see that Gandhi is again working for a compromise with the British Government. It would be a fatal mistake to lionize Gandhi or to praise him too much. This will strengthen Gandhi’s position and show that we lack self-confidence. The correct tactic will consist in strengthening the position of our followers in the country. Please do not think that the Congress means Gandhi. The Congress means Gandhi-wing and Forward Bloc. Gandhi may command a majority within the Congress Party, but the Forward Bloc has a large following in the country. This following of ours has been built up after years of hard labour and sacrifice – and neither the British Government nor Mahatma Gandhi can destroy it. The following will stand by us under all circumstances. It will take up arms at right moment and it openly advocates a pro-Axis policy. To expect that Gandhi will come over to our point of view is only an idle dream. Consequently, to strengthen Gandhi’s position by praising him too much, amounts to weakening our own following and committing political suicide. You may occasionally pay a compliment to Gandhi as a political manoeuvre, but you should always remember that Gandhi will never come over to your side. [dropcap color=”#008040″ boxed=”yes” boxed_radius=”8px” class=”” id=””]T[/dropcap]he reader is now left in no illusion about Subhas’ views on Gandhi, Nehru, etc. Subhas could accurately assess their dishonesty, ideological bankruptcy, and proclivity to compromise, though following his own advice, he may occasionally have paid compliments to them as political manoeuvres. But he opposed them with all his might whenever he believed that they harmed India’s interests, which their connivance with partition was. Since Rashbehari had left India in 1915, the year in which Gandhi had returned to India, and which was several years before Jawaharlal Nehru joined Indian politics, he could only form his views about the duo by reading those of their public statements that reached Japan. Thereby, he had likely formed a rather generous view of them, and he would certainly not spend his political capital to oppose them although he clearly fundamentally disagreed with their methods. T. R. Sareen “Subhas Chandra Bose and Nazi Germany” , German Foreign Office Records No. 350084-85. Excellent research n write up. Excellent write up n research. Unfortunate that after centuries of foreign invasions n rule, Bharat was ruined by nehru and gandhi. Own citizens. Keep up the great work. Feeling comes to mind that were Nehru and Gandhi really Freedom Fighters or agents of British as their actions always were in demoralising and weakening True Freedom Fighters and helping invader British?